AI is undoubtedly going to have a profound affect not only on society but also on the way we do business. There has been a lot of scaremongering about how many jobs will be lost due to AI as well as how robots will control the world and man versus machine. This sounds very reminiscent of the Luddite movement of the 19th century (the term Luddite was given to a group of English textile workers who destroyed weaving machinery as a form of protest to the use of machinery in a “fraudulent and deceitful manner” and has become a term to mean those opposed to industrialisation, automation, computerisation or new technologies in general). In fact, like the scaremongering of the 19th century when cottage workers thought their jobs would be lost to machines we now find ourselves in a similar situation when people come to discuss AI. It is caused by the short-sightedness of workers on how they view they future in relation to the role they have now as opposed to how it will evolve and become. Indeed, the industrialisation of cottage industries such as textiles to large-scale enterprises housed in large factories created economic growth which the planet had never seen before, leading to rapid expansion and globalisation. AI offers the same opportunities now as mechanisation did in the nineteenth century. 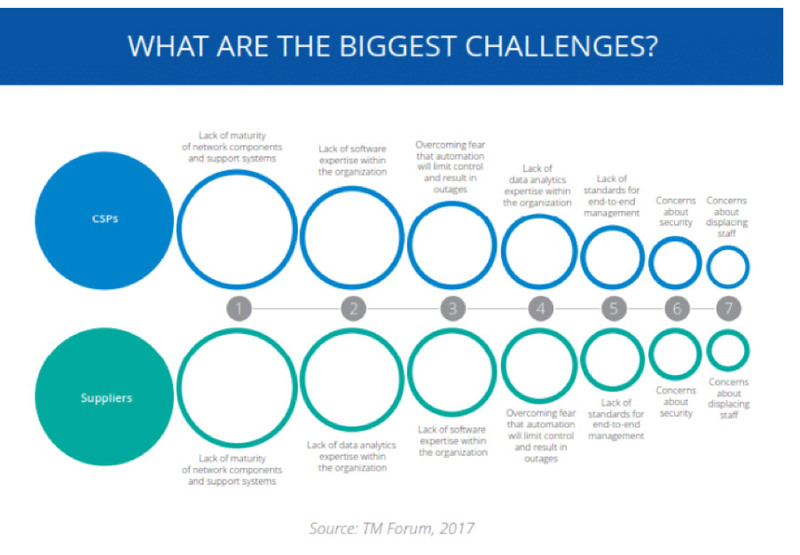 Indeed, in the survey carried out by TM Forum for the Trend Analysis Report on Artificial Intelligence back in December surveyed 302 senior executives from CSPs and suppliers and the impact of AI on displacing staff ranked last on the potential list of challenges by both CSPs and suppliers. Similar findings came up in the 2017 Deloitte “Cognitive Aware” survey which was presented by Tom Davenport a professor at Badson College and MIT on the recent CA Technologies webinar on AI Operations (which is well worth a listen). The survey asked a question around the relationship between AI and the workforce in the future – what will be the impact on jobs: loss or shift? The survey showed that most people think that workers and AI/cognitive technologies are likely to augment each other to produce new ways of working and that we are likely to see many new jobs created from AI/cognitive technology and I personally couldn’t agree more. The key to successfully deploying AI in any parts of your operations, whether they be listed in the above examples or not, is to moderate your ambition, and go for low hanging fruit and take a step by step approach and get started now. Davenport also agrees with this approach and states that you need to “start with automated analysis versus full blown automation”. He also went on to say that you don’t need to worry about full integration at the point but instead declare small wins and keep building. With this in mind, you should be striving to free people up, not eliminate them and get them working on the next big problem that AI can’t yet solve. AI should be seen as an enabler to do business better and more efficiently and be used to open up new opportunities which couldn’t be done by humans. KPN serves as a good example which says it uses AIOps to analyse such large volumes of digital data that humans simply couldn’t analyse without the use of technology and moreover, they are using AIOps to help find the cause of network faults much faster than most humans could. Start with quick win cases which are easier to complement, e.g. alarm clustering and suppression, predict capacity needs etc.